10/14/2015: Added Suggestions 28, 37c, and 37d. Also revised/updated â˜… ratings, and removed â˜… ratings on patched suggestions. 9/25/2015: Added/Updated Suggestions 3, 15, 28a, 40, 41, 54, 55b, 57, 59, 60. 9/10/2015: Updated hero balance changes and Added suggestion 52b. 9/8/2015: Added Suggestions 13d, 54, 55, 56, 57, and 58. Updated â˜… ratings and color of older suggestions. 8/27/2015: Added Suggestions 16b and 52b. 8/26/2015: Updated Patched Suggestions 3, 5, 8, 8a, 13, 14, 17, 22, 49, 52 and Added/Updated Suggestions 7a, 13a, 13b, 13c, 17a, 50, 50a, 52a. 8/6/2015: Updated Suggestion 13, and minor link updates. 7/22/2015: Added/Updated Suggestions 8, 13, 15, 16, 37, 46, 51, and 53. Suggestions Gallery (Without red boxes to highlight areas) - Original images to get a better picture of some suggested UI changes etc. The Beginning of a Breadolution! (Reddit Discussion) - A toasty discussion about bread suggestions 23, 24, 24a, 24b, 25. SBW Analysis/Solution & Weapon System Proposal - Why Re-rolling SBW is a good idea, and new weapon system proposal. Achieving Balance - Suggested solutions to a few of the main issues in Crusaders Quest. [â˜…â˜…â˜…â˜…â€‹â˜…â€‹] - New 'â˜…â€‹' ratings added to suggestions reflecting how important they are (imo) to be implemented. [Patched! X/X/XXXX] - Suggestion that has been patched with an update on 'x' date. Link to patch notes will be provided. [Suggestion] - New/Updated suggestions are highlighted in red. [New UI] - New graphics/user interface to be added to the game. [Update UI] - Updated graphics/user interface to be modified in-game. [New Game Mode] - New game mode to be coded/added to the game. [Game Balance] - Suggested changes to be made to the gameplay to make CQ better overall for players. [Suggested by Username] - Link to the original suggestion post. - Add current server time clock (24 hours). - Recommended areas are highlighted in red boxes below. - On the left side of the screen under user info or to the left of your total honor or user info. - OR modify the castle tower in the middle to be a clock tower with the server time displayed. - There are reports of newer phones interpreting screen taps as slides. This results in scrolling the town instead of opening the menu you want. *Sending Honor will give you +1 meat! In order for you to receive Honor, you must give Honor first. You will now receive honor from the Friends tab instead of the Mailbox. The new honor system is awesome! It's more rewarding for those who are honorable. *Auto Scroll has returned! If there's a left arrow be sure to tap above the current friend to keep the auto scroll going without having to go back to send honor. *Note: The whisper function is broken and doesn't work at all. Also there are small improvements listed below which can still be worked on. - Add button to send honor to all friends as well as a button to hop into chat and strike up a conversation with a friend to help WB or whatever it may be. - Honor should also reset daily (maybe with the attendance rewards etc.) rather than having it reset every 24 hours. - Also a small indicator of whether your friend is on or offline currently. Represented by a green (online) or red (offline) circular icon or something similar. - Refreshing the list to add friends should be more user-friendly rather than closing the window and re-opening it multiple times to get it to refresh. - Add the ability to swipe/pull down to refresh the friends list or add a button to refresh the suggested friends list. *Bringing friends into battle will now give additional experience to your Heroes! You can also now bring a recommended friendâ€™s hero into a World Boss Battle. After the World Boss, you can now send a friend request to the team that went into battle with you. *Maybe if players use level 60 heroes and there is no bonus exp reward a bonus gold reward can be applied instead? - Reduce 24hr cooldown for using a friends hero. Maybe 6 or 12 hr cooldown. - Consecutive days or using your friends heroes â€˜xâ€™ number of times in battle for a reward of gold or honor daily or weekly. - Increase the honor received from using friends heroes in battle or change it to â€˜xâ€™ amount of gold. 10 honor? 20 honor? Maybe 100 or 200 gold? - Maybe using friend in battle gives you a party buff that increases your chance to find chests or increases gold/exp. 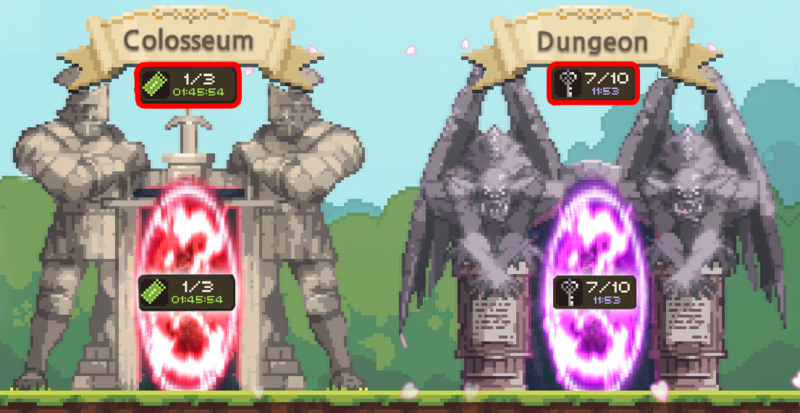 - A visual of the amount of dungeon keys/colosseum tickets over, ontop of, or just below entrance of the Colosseum and Dungeon graphics. - Simple UI change to make it easier to find out when you're able to burn a colo ticket or run a dungeon. - Both World Boss and Player vs Player duels need a UI update. Itâ€™s not efficient to have to keep refreshing your ally by closing the window and re-entering. 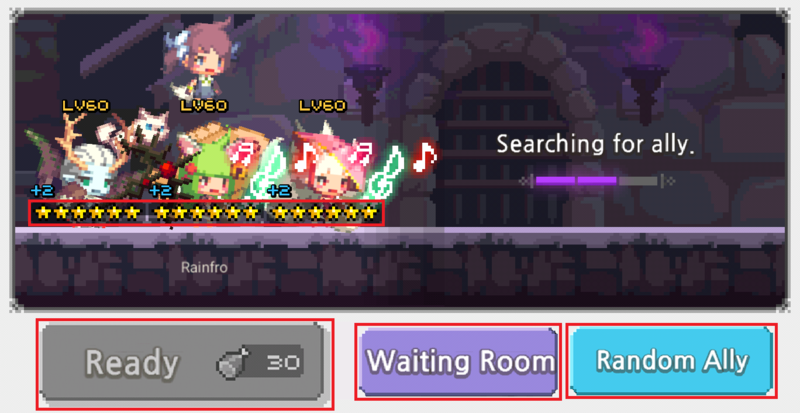 - The â€œRandom Allyâ€ button should stay on screen at the bottom along with the â€œWaiting Roomâ€ button. - The stars should be below the hero rather than covering up half of the heroes body. - More detailed breakdown of damage done by each hero at the end of WB fights. - Remove the MVP system, and reward both players with 2 loot rolls for defeating the world boss. - Both work hard to kill the boss, and 1 player bringing more heal to keep the teams alive while the other bring more dps to kill the boss faster. Why is the game penalizing the one that bring the healer? He/she equally contributed to killing the boss, but because the dps guy can do more dps on the boss that doesn't always mean he contributed more. *I believe this was implemented. I saw a similar notice like sample concept pic below, but it could still use a few features listed below. - Add a notice (maybe scrolling) across the top in the chat window rather than being spammed randomly on the screen which some players may miss. - When a GM or Admin sends a message it will be broadcasted (highlighted) in the small chat window box for all channels. - When the player opens the chat window they will see the GM Notice message across the top in bold red (suggested color scheme). - Notice may scroll infinitely or be displayed for a set amount of time. Also it may be hidden/blank if there are no notices/events going on. - The notice message may be re-broadcasted in the chat at certain intervals if necessary. Example: Maybe re-broadcast a maintenance message every 10-30+ minutes or so, and more frequently when it's closer to the time. Maybe modify the message to remind players to exit the game safely or finish whatever FoS or WB they're battling in when there's <15 minutes before servers go down. *You can now tap on a players name to view/add them and there is a new mute system in place for spammers, though a report/block function could still be implemented. Could you guys consider adding something like a Ignore/block button or report button on the chat area because there seems to be a lot of spammers these days. When you tap a username in the chat there would 3 options: add, mute, and report. - After muting them they would be permanently removed from your chat until you restart the game or go to the mute list and unmute them. - The report option could be useful for spammers/advertisers or anyone using inappropriate language. - Overall this would lead to a more fun, cleaner and healthier chat without so much friend invite spam, bots, or trolls. - Create channels for chatting/help/LFP (looking for party, ie for WB)/etc. - Bookmarking a chat channel to auto-reconnect. So that rather then having to type in a channel every time, you automatically connect to a chosen channel. - Players can actually form some kind of community in game, even if you made it so that you can only bookmark 9000-9999 it would be nice to be able to talk to the same players without hoping that both of you had the same idea. - Friends list tags, to let yourself know who's who, preferably typed but also viable is shapes or numbers. - Friends in the live chat should also appear in a different color so they're recognizable. - Whispering a friend or player should show which channel they're currently in (if in a different channel than you). - Have access to the chat window in-game while you're questing etc. so you don't miss out on what others are saying. - Tap the 'Team' button beside 'All' or tap the bottom left corner and sort 'By Team' (preferred method). - This will change the 4 tabs into 4 preset teams you can switch out on the fly! How to set/save team setups? - Tap the bottom left button to sort "By Team" to access the Team Editor UI. - *If you have set your teams then tap which team tab you'd like to use, and close the window to return to what you were doing. - Finally tap save in the bottom right to use that Team comp in a later battle! - Maybe remove Melee, Ranged, Support tabs and have Teams readily available and/or include those in the Sort By Melee, etc... instead. - Make long text scrolling, and in some cases wrap text properly so itâ€™s not off-screen (Conversation with Maria during her epic quest goes off-screen). - Wording is very unclear atm (User's skill, User's Resistant, The Hero, etc). It's hard to decide if that skill is good or not by just reading the text. Sometimes "user's" mean "caster's" / sometimes it's about healed unit / sometimes it's about target. Similar words can be interpreted in many ways. - Damage percentage should be clarify as hit â€˜xâ€™ damage. - For example (Consecutive shot: shoot 12 bullets of (7%/12%/30% each) or shoot (3,5,7) bullets of (7%,7%,15%) each. Clarification on count as â€˜xâ€™-chain. Some units will trigger chain-3 in text (like Maria). But those chain-3 aren't counted as chain-3 for others while some units (like No.9) trigger 3-chain, but no skill text appears. This makes combo-ing/skill-balancing difficult because you won't really know how a skill properly functions. - Highlight Regular Transcended Skills in gold as well as Special Skills flashing gold (or red or some other noticeable color). - Skills should also have a gold dotted line or a special animation circling the skill icon in battle to show it's transcended. OPTION 1: Dim/blacken the background. OPTION 2: Use a caption, eg: "TRANSCENDED!" OPTION 3: Epic sound effect. OPTION 4: More colorful or different color skill effect. - Option 4 or a combination of the 4 is recommended. It isn't 100% necessary to implement all the effects because the game may lag or slow down on older devices. This is suggested mainly for PvE, but can be used for Colosseum or other stages if you wish. It helps to make Level 5 transcended skills more awesome! - Re-transferring a special skill that's already transcended will make your heart skip a beat followed by a sudden burst of rage. - A BOLD message saying you're about to overwrite an already transcended skill would bring peace to many players. - For example, Woompa's SBW passive Totem Dance Time!! - Lilith's SBW passive Resurrection, etc. - Maybe a clock icon or timer below their hero icon when the passive is in cooldown? *A new item called VIP forging ticket has been added in-game to re-roll BOTH SBW slots. You can obtain it exclusively from the updated Gold Weapon Box. - It's a start in balancing the SBW grind, but I think there's still room for improvement. - Rare drop exclusive from the Gold Weapon Box. Similar to the chance of obtaining a 5-6* SBW. - Similar to the VIP forging ticket, but it can re-roll your choice of 1 slot. - Bring back the last 2 stages in FoS which can offer a chance to obtain pieces of a VIP forging ticket. (1) Add an Option to forge a new 4* SBW from 2-3 previously forged SBW. - The newly forged SBW cannot be any of the SBW used to forge the new SBW. - Re-forge unwanted SBW into a new SBW for a hero you actually need it for. - Maybe half or a third/fourth of the material/iron/gold cost to forge one. - If necessary material cost can be increased to forge SBW. - It might cost 'x' gems or 'x' honor, but preferably 1 slot should be re-rollable. - Maybe a new item or currency found within Fortress of Souls as a rare drop or a brand new stage/dungeon can be added in-game to provide a slot type re-roll function. - Collect 5 crystal fragments from the new Fortress of Souls stage or dungeon to fuse together and create a crystal ball. Upon using the crystal ball your SBWs slot(s) will be reset 1 time. - 'Coupons' with the ability to transcend any skill chosen, add a random great conversion to a weapon, or re-roll an SBW keeping the same slots. - These 'coupons' are only available exclusively from a special dungeon, limited time event, added to a new or current weapon box / new item(s) in the shop. *New locks have been added for weapons! Though adding favorites is still an option and locking 4* or higher heroes automatically if it's not already in effect. - Make 4* or higher heroes automatically locked from retirement. - Tap to add a weapon as a favorite. Maybe a tiny pink heart icon? Favorite weapons cannot be sold. - Add a tab (heart icon) to view all favorite weapons? *The weapon UI has been improved and is now very snappy, and weapon stats are displayed while selling/salvaging! Even with the gem resets it is extremely costly considering how much the gold scales up per upgrade, the value of gems vs gold when resetting, and of course the useless conversions like +80 HA. I used to hoard gold until Fergus gets an 'upgrade' for great success then drop it all on weapon upgrades, and come out with hardly anything better than what I had previously or maybe even worse. This is pretty disappointing and after spending 100,000's of gold multiple times I have nothing left, but a sub par weapon to show for it. The best way to go about it would probably be to implement that system you mentioned which is essentially the same thing minus losing your preferred conversion. c) and/or they limit the lower bracket "great success" to 1~5* as well as remove useless conversions like +HA. Another alternative is including the full range for attributes including both the upper and lower tiers. Example: 1-6* Weapon Crit Damage range would be 15~75%, and "great success" would mean a true great success with guaranteed 86.25% Crit Damage or other great attribute. Rather than having the 2 split into separate tiers with 15~30% (low tier) and 30~75% (high tier). - Have the option to choose between either your old weapon upgrades or your new one. The cost of gold per upgrade may increase accordingly. - Let's say you have an 16% HA on your weapon, and you roll 10% HA. You could keep the 16% HA and continue to re-roll for higher HA. - Add a new NPC to refine a weapon to increase its base attack (up to 5-10 refinements), enhance great conversions, add unique enchantments or skills/abilities. - Add a new NPC to add sockets to your weapons and apply or remove socketable gems or items to your weapons. - Add new socketable items such as gems, as drops with different rarities (normal, rare, epic, legendary) and attributes/abilities/unique effects. - Add a variety of different tier socketable gems to Popo's inventory. - Maybe this new weapon level up system can be unlocked or available when reaching level 60 (or higher if the level cap is raised for this feature). - After forging a 6* SBW and rolling the perfect slots/conversions to allow further weapon enhancement a weapon level up system could be implemented. - Add a new dungeon to gain SBW weapon experience, or any exp gained for any hero after completing a stage can increase weapon exp as well. - When a weapon levels up it will increase the attack by a certain amount, and after reaching the MAX level it can gain another slot? or maybe add sockets? *Absolutely loving the changes for weapon salving in the new update! +1 Greatness to the TOAST team! - Added a chance for Great Salvage for both regular (free) and premium salvage! - If no weapon is equipped going into battle the hero will auto equip the last weapon used or a warning will appear that no weapon is equipped on â€œxâ€ hero and recommend a weapon to equip on that specific hero(es) and/or bring up the weapon window to equip one then return to the battle menu. - The weapons set on heroes in Quests, PvP, Colosseum, World Boss should be saved for those modes specifically so you don't have to constantly re-equip weapons. - Add a quick access window/tab to view weapons recently equipped on each hero to quickly change back and forth. - Add a weapon history of new weapons found from quests to view/sell them quickly. Maybe an option to sell/salvage all 'new' weapons. - For a regular quest enthusiast it becomes a chore to open the weapon window simply to sell/salvage the pile of 1-4* weapons preventing you from starting a quest. - Add a â€œSell/Salvage Allâ€ button with a confirmation window if you would like to sell/salvage all 1-6* weapons. - You could have the option to tick 6 boxes representing 1, 2, 3, 4, 5 and/or 6* weapons you'd like to sell or salvage. - Also including the 6 icons below for different weapon types if you'd like to sell all 1, 2, 3, and 4*Hunter, Priest, Melee weapons only. - Then tap sell or salvage and all the weapons of the specific ranks you chose would be sold or salvaged all at once. - Add a recently obtained weapons list/tab to sell items you've obtained from a quest and sell them quickly. - Light are selected to sell and dark are not for sale. Total gold/iron will be given to you after pressing either button. (Maybe add confirmation window). - Salvaging weapons for iron could have a separate window that comes up afterwards (like it currently does) asking if you want to do free salvage (maybe a possibility of a GREAT! salvage) or premium salvage. - If the bread golem doesn't satisfy your jelly roll fix Chocolat has the nerve to bake a batch of fresh ones for you every day! After expanding your bread storage youâ€™ll quickly realize 90% of the time youâ€™re there is because you need to sell the 1-3* bread hogging all the space. Increasing the limit only delays this process until you finally have enough 5-6* breads to promote 1 5* hero if that. - It simply becomes a very repetitive and annoying chore to tap and sell 1-3* bread especially when youâ€™re near max capacity without any idea on who to promote if you actually have enough gold to use your bread. 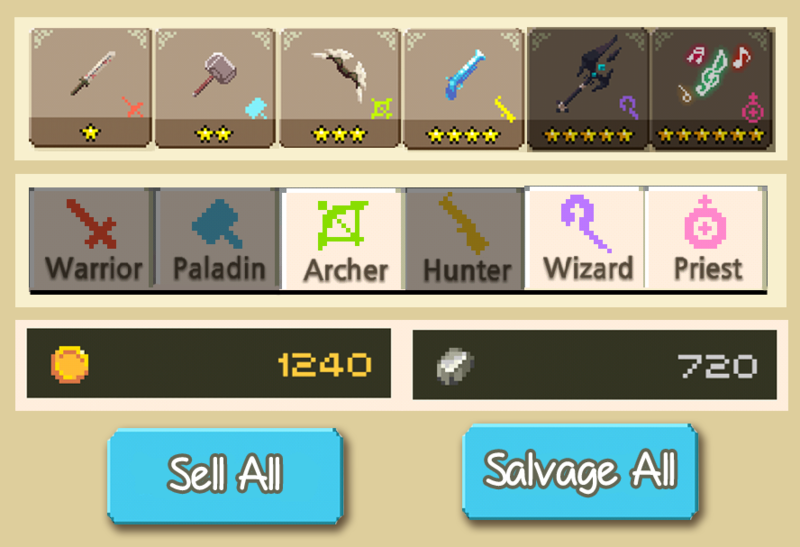 - Add a â€œSell Allâ€ button with confirmation to sell all 1-6* bread with similar functionality to the Sell/Salvage All weapons button. 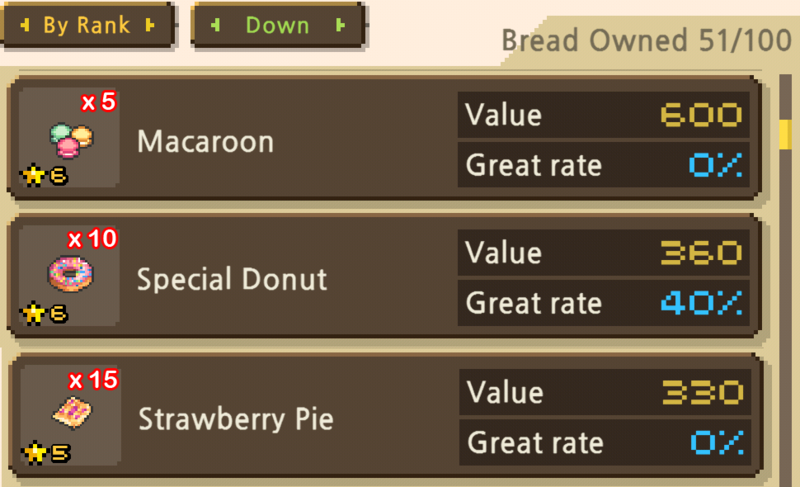 - Being able to tick your choice of which star breads you want to sell all at once. - I just lost Archon that I finally got after many promotes from 3 stars and I mis-clicked on re-promote so I lost 3 gems and Archon. - Please add a confirm or cancel window after re-promoting a hero. This is really important, I don't wish this to happen to anyone. - Maybe redesign the window so the cancel button isn't too close to the re-roll button. *New Great meter was added which is displayed in blue! - Give us the ability to combine 2 (or more) of 1 type of bread into 1 tier higher version. - Add a most recently used oven slot at the beginning of the bakery oven window. - Sometimes scrolling in-game is kinda buggy and instead of translating the touch and slide as scrolling, it registers the tap and causes you to select the wrong oven. - Adding a cancel button to an oven that's in the process of baking to allow us to re-select a different oven would be great. - After failing 90% Great! chance multiple times on a 4-6* hero itâ€™s just not worth attempting anything below 100% anymore. Bread is one of the main resources to promote heroes and progress through the game, and always using the same combinations to make 100% great value is no fun. Especially when you have a large town of crusaders and they demand a truck load of carbs that only gets worse when theyâ€™re all closer to MAX level. - It would be displayed just below the Great meter and when the Super meter is filled it's Red compared to the Blue filled Great meter. - Example: You could have both a 15% chance for Super rate and 80% chance for Great rate. - OR the requirement for Super rate would be that Great rate must be 100/100. (This method probably makes more sense in the long run). Having a chance to gain SUPER!! 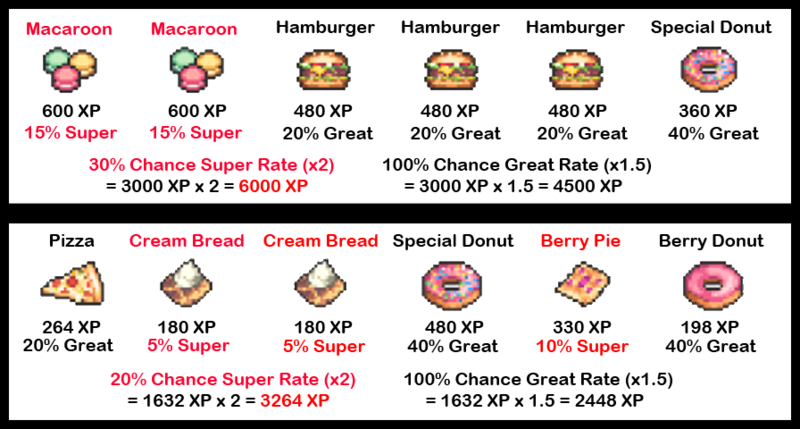 2x bread exp rather than the typical 1.5x exp from Great! would be exciting and something to look forward to while training heroes, and in some cases eliminate the rage inducing single-point-to-reach-the-MAX-level incidents. Example: Pizza + Berry Pie. - Round up all bread values to make bread XP calculations easier, and reduce the chance of the 1-XP-to-max-train-hero issue. - AND/OR why not take things a step further and round bread XP to the nearest 25, 50, 75, 100, etc. - Rather than scrolling through mountains of jelly rolls to find your sandwiches and pizza why not make bread stackable? - The bread inventory count would still be in effect, and it would be so much easier to find bread and train your heroes. - A step up from Master Oven. Keeping inline with ~3x the wait time, the Ultimate Oven wait time will be ~72 hours. - Reward: Rank 3-6! ~8 bread, Rank 6! 1 bread. (Amount of Rank 3-6 bread can be tweaked, but at least 1 Rank 6 should be rewarded). - While using milk there should be a buff to double the gold rewards (or 1.5x) and/or more account exp rewarded from quests to make it worth while. - Maybe add a button to toggle it on and off until the time expires so it's good down to the last drop. - * Also a new reward screen was added at the very end with the total amount of meat you've earned including the results of the 5 matches wins/losses! - Increase the max capacity for Colosseum tickets to 5. In-game rewards of 3 tickets will overflow from the max capacity unless they are sent separately in singles. - Less stressful and some players lose sleep to Colosseum because of refreshing max tickets every 6 hours. - Add button to rematch an opponent in friendly PvP. - Add a button to add an opponent in friendly PvP as a friend. - PvP matches you with an opponent who can be much weaker/stronger than your current team. It should search for teams based on your current team's level/stars. - There's also no ranking system, so even if I do get matched with another 6* player we could be leagues apart, maybe he's running a full maxed team and mine are all only +2, I won't even consider Colosseum as a PvP challenge, more PvE using pre-built teams. - Ranked MMR PvP system that resets each week/month. - Matches between only live players. - No preview / chance to cancel once you see opponents team. - Another thing that I would like to see is damage / healing record for PvP matches, the system is already in game why not add it to where it would have the most benefit? - Certain options would not be able to coincide. Example: You can't activate the 'blocks only 1-chain' option with the 'special skills only' option active. - Customize an AI controlled team of your choice with any 3 heroes available in the game. - Choose their weapons and weapon conversions. - Select their hero level, training level, skill level and special skills. - or fight a random team or a hero with unlimited HP that can move/fight back. - or choose to fight either 1,2, or 3 dummies that fight back. - Show skill text immediately rather than slowly typing/fading in. Last edited by D3Inity; 10-14-2015, 10:16 AM. Reason: Added Suggestions 28, 37c, and 37d. Also revised/updated â˜… ratings. - New dungeon available daily/weekly or on certain days. - Beat up some bread baddies to get random bread droppings with your friends! - Similar dungeon to FoS except you can battle with your friends to take down heroic monsters that drop all kinda of LW materials rather than gold. - There's Gold Dungeon, Bread Dungeon, but what about Honor? Enter the honorable dungeon and your mountain of honor will transcend into the skies! - Fingers crossed that they're developing a mode like this in the near future besides the triple team PvP. - That sounds a lot more fun to have a randomly generated endless stage/arena or '~100' wave massacre where you steam roll hundreds of mobs that become more challenging as you progress and maybe even with a live friend(s)? - You could be competing for top DPS/heals MVP for some old weapons, gold, honor etc. Maybe even materials for LWs? - It could cost any resource or even be able to enter 1x a day or more with or without an entry fee. If not competing with any friends at least have a leader board for your own friends and some decent rewards. Encompassing everyone into the competition would be too difficult to compete and the rewards unless they included gems wouldn't be satisfying for the whole player base. - Chests would be awesome as well after each run. - Maybe bosses that drop chests every 10 or so waves. Maybe having 3 set teams to fight through all the waves solo play with the same leaderboards/rewards (would be way cooler with friends though especially Live*). - One other mode they could add is a Real Live World Boss with millions? of HP where you have 'x' chances that refresh every 'x' hours to enter the fight take down a unique legendary boss or enormous army of monsters before time runs out! The leader board would keep track of the amount of damage you dish out and the top % players would get rewards like gems, weapons, gold, meat, LW mats, etc. One can only dream so much until Toast makes it happen. - Reading through some of the heroes descriptions, we know there is a "Neth Empire" being the centric force of the story yet they play almost no part in the story. - Invasion would be a simpler, one time event. Say, for 8 hours, a legion of 1000000 Neth soldiers are coming, and players just join in the fight to thin the numbers. - Each player encounters a wave similar to quest mode, and obtain rewards similarly. If the legion is wiped out before the timer runs out, everyone gets a reward. - Conquest mode can be an alternative mode to the Colosseum we have grown to hate (or love, if you get 55 gems from it every week). 2. On a map, each side needs to control certain portions of the map. Players can gain control once they destroy any troops occupying the area (say, 100 faceless Neth Soldiers, which will require 10 battles to clear out). 3. Once the troops are cleared out, Players of that faction lay claim to that area, and that portion of the map belongs to their faction. 5. Events can randomly pop up for players to lay claim, such as a Neth Convoy holding jewels, for example. 6. The Conquest is over at a given time, like 1 week as the Colosseum does, and the side who holds more areas win and is given a bounty. The losing side will also get a reward for participating. - It would be nice to have a Tag/Banner that you and your friends can play under. Also it would be nice to have a Guild channel so that you can talk with friends and put the chat to use because currently I don't think anyone uses it. - Along with the guild function, a Guild Raid should be added where players of a guild can spend their meat/honor/keys (or even a new type of stamina) to contribute damage toward a boss for rewards once the boss dies. - Each player would have 30 seconds to deal as much damage to the boss as they can before they are are kicked out. Obviously the boss can deal damage to them so if they aren't careful they can die before the 30 seconds is up. - Each boss would have an absurd amount of health and when the boss is finally killed each member of the guild will be rewarded with meat/honor/keys/gems/weapons (up for devs to decide) for their contribution. - This would allow devs to add content much more easily since all they have to do is add a new boss every once in a while to keep players busy. - There can even be a leader board to show which guilds have the most boss kills each week and more rewards could be given out. - Pressing the 'Retry' or 'Next Stage' buttons after completing a stage/dungeon should bring you back to the hero selection screen of that same or next stage. - Change so that the 'resource check' occurs after you press 'start' on the hero selection screen rather than the quest selection screen. - If you don't have enough meat/keys when you hit start a popup message will inform you you're short on meat or keys and send you back to town. - There should be a bigger variety of quests that offer a combination of rewards. - Reduced meat to enter quests event, increased chance to get rare weapons, bread, more gold, etc. from quest chests event, increased quest exp event. - There could be Special Dungeons or Quests with monsters that have unique skills or attributes. - Champion monsters that drop rare/gold chests with better items? - Randomly generated waves of monsters and scenery? - Maybe quests that require you to replay previous stages or have certain requirements like dungeons. - Quests or Dungeons that donâ€™t allow ranged/melee heroes, only â€˜xâ€™ star heroes, no healers, etc. - Quests to kill â€˜xâ€™ mobs, save â€˜xâ€™ souls, use this skill â€˜xâ€™ times, fight â€˜xâ€™ times in PvP with rewards that include a mix of both gold and honor. - Monsters could be 200% bigger (giants) or 200% smaller, or maybe your heroes could be 200% smaller? etc. - Include quests to use friends in stages, and improve rewards for using friends. - Add different types of chests for quest rewards. Example: Weapon chests, gold chests (bronze, silver, gold), bread baskets?, etc. - Add better rewards overall for stages with chances to obtain all class items on the last stage of each area/episode. - Add iron as a chest drop, more frequent drops for Old Weapons and slightly better bread. - Make it possible and more likely to obtain 4-5 chests from quests and make 6 chests a possibility. - Add a Dark Sera quest (10 kills) which rewards more gold than the Dragon quest. - Add a Dio-Nemesis quest (10 kills) which rewards less gold than the Dio-Nemesis DX quest. - Add epic repeatable quests (rare appearance rate) for iron or even greater amounts of gold. - Add weekly epic quests that have better rewards like 5-6* bread, old weapons, and/or VIP tickets. - Epic quests could be completing a special dungeon (above), defeating the final stage bosses for 4 episodes, evolving a 5* hero, etc. - A list of all quests, like they did with list of all weapons, so we can see the requirements and rewards as well as how to activate or unlock certain quests. - Maybe have an epic quest for completing all Quests or a specific chain of quests? - Tundra quests should yield more treasure chests/better rewards. Currently I'm averaging about 1-2 chests and stage 4-24 hard drops 3 alone on the boss. - Similar to the server time; after forfeiting a quest a small timer should popup displaying a countdown until the next quest appears. - Maybe an empty hero box with a ? and a timer on top or below it? 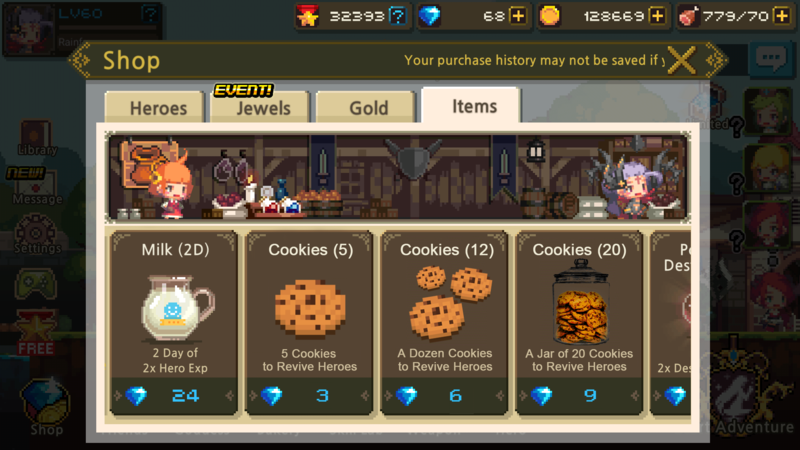 - Remove Colosseum Tickets from Popo's Inventory. - Lower the cost of Popo's items and add 5-6* weapon(s)/bread at a reasonable gold cost and low rate of appearance. - Add SBW materials like Crystal Powder/Shards and/or Iron to Popo's inventory? Limited time event? - Popo's timer should start when you return to town or when you tap her icon in town the timer will start counting down. - *Addition of Destiny points is a similar concept which has been added in-game, but soul fragments can still be implemented for legendary heroes. - It's extremely difficult for some players to obtain a Legendary Hero because its 100% reliant on RNG which can be very cruel at times. - The droprate of current Legendary Heroes is about 5% or less which mean about 1 in 20 attempts or 5~100 keys you should get a Legendary Hero. - BUT Many players either quit or give up due to the fact they haven't gotten any legendary hero in a ridiculous amount of attempts or lessen their expectations to basically nothing. - Some reward of Gold or Honor drop from the legendary heroes defeated in battle. - New Legendary Hero Soul Fragments which drop from the last floor in each Legendary Dungeon. - 6 types of Legendary Soul Fragments to represent the 6 unique legendary heroes. - If you manage to clear floor 20 you have a chance to obtain 1 Legendary Hero Fragment of either type of Legendary Hero at a % chance or a guaranteed fragment. - Add a coupon/function or NPC to trade 3-5 of a 1* legendary hero to receive the other. Example: Trading in 3-5 1* Cano for a Teresa or 3-5 1* Teresa for a Cano. - Heroes walk separately after defeating them in any legendary dungeon to make it easier to distinguish if destiny points or heroes are obtained. - Defeating D'Artagnan & Leon you'd receive some gold and/or honor. - Also 1 Soul Fragment for either D'Art Fragment (Hunter Fragment) or Leon Fragment (Warrior Fragment) guaranteed or at a % chance with possibility of nothing. - After collecting the necessary amount of shards to summon that specific hero you can talk to Lednas to fuse them into a Legendary Hero! *These are only values to give an idea of how the conversion should work based on the information above. - *Not sure of the exact date, but they increased the legendary material rewards permanently after the increased material event. - *You can also obtain more legendary material in FoS from doing the mini-quest to protect or destroy the crystal tower in a particular stage. - We are encouraged to form more balanced team thanks to this Fortress of Souls chapter, but I think we are getting more heroes and more possibilities yet to be found. - Why don't you give us a historical team formed with win/lose data so as to improve our combination? Our data will help you to balance the game eventually. - My suggestion is to implement a log sheet in the game or a web portal login will do. - A history of previously used heroes for each FoS stage would save a lot of time rather than trying to remember which heroes you used to complete a stage. - This way you can swap around and keep track of how well teams are doing as you upgrade your heroes and progress through FoS. - Ideally stage clear should be instant when either all mobs are defeated in the stage or all heroes on either team have been defeated in Colosseum. - No waiting for your heroes and goddess line up especially if they're far off screen from skill effects. - It shouldn't be necessary to have to load back into town after every Colosseum battle. - Maybe code a new area/map different from the town that's specifically designed and dedicated to the Colosseum. - Colosseum rewards should appear on screen instantly, and next opponents should cue up after winning/losing a Colosseum match. - If a player schedules their bread to be finished every 24 hours, they may reasonably check every 24 to see that it's done. - In my case, I have 24-hour bread scheduled to be done every morning when I wake up and turn off my phone's alarm. However, because it's an exact 24 hours, the time to actually getting the bread will always increase by a minute or two, and throughout the week it will get 10 minutes or more farther away from the time I wake up. - Inevitably I will forget or not get to the phone in time, and the bread will shoot considerably past the time I wake up. - If you implemented a 23-hour bread, I could check it every morning on the same schedule, and I don't think there's an issue of game balance in this regard. It would a simple quality-of-life improvement. - There is always an overlap on any month that has more than 28 days. Today is April 30th and I've had two days where no reward has shown up: this goes against the purpose of the system, which is to reward players for logging in. - It is disrespectful to the player's time. If someone's phone dies or they're otherwise unable (or unwilling) to play CQ for 3-5 days, why should they lose the biggest rewards? Especially if the player loses connection for 3-5 days at the beginning of the month, they will progress through the daily calendar knowing that at the end, they will not get the biggest rewards. This also goes against the incentive of logging in daily." - *New ninja patch added a fancy new UI with more details for the daily login gifts as well as rewards for new and returning players. *Seems like the patch notes are being updated even after they've been posted which is great, but I think there needs to be better communication between the developers and TOAST Staff on the forums. Some information is still not disclosed which is understandable, but hiding the details on big changes such as upgrading the AI in Colosseum making battles much more difficult should be addressed along with other issues. - Any new features, game modes, dungeons, tutorials, etc. - Any new heroes added in-game. - Changes that are hero-specific. - Examples: Leon gets 10 additional resistance? Chai's food gain magnetic ability? Archon's electric ball reduce 1 hit? - Examples (General): Tweaked armor/resistance value? Warriors walk faster? SP gain nerfed/buffed? - Examples (Items / Weapons): Potion of Destiny is cheaper by 1 jewel? SBW finally gets a re-roll? - General changes that DON'T affect game balance. - Usually pertaining to layouts/graphics. - Hero's visual changes goes here as well. - Self-explanatory. It's important to continuously address bugs that were reported in previous patches but have yet to be fixed. - Bugs/issues that are known and work in progress to be fixed in the upcoming patches. - It can either be toggle-able in stages allowing you to turn it on/off while you are questing or permanently activated throughout the entire stage. - Player should still be able to jump in and interact/pop blocks even as automode does it own thing. 'start' the fee will be deducted as well as meat and the stage will begin. - I think this post below pretty much sums up the reasoning why this feature should be implemented. I get that completely automating a game makes it no longer a game. But it's just as boring to do the same thing over and over and over and over... and... over. That's then a game stops being fun. This game is incredibly prone to that particular problem as it offers no other gameplay mechanics at all to give players some variety from the 'poking blocks in the right order' mechanism. The best games figure out how to either break the repetition with something else, or offer a way to skip some of the boring parts. The fun bits here that aren't poking-at-blocks are team building, hero collecting, hero upgrading, that kind of thing. It's stuff that doesn't take long, mind, and it all requires some form of grinding away to get to those bits. - A 'Start Now' button added at the stage rewards screen which allows you to replay a stage instantly after tapping it. - After pressing the button it will start the stage immediately deducting the meat required for that stage, using the same heroes for that stage, etc. Epic heroes can only be obtained by combining 2 max level 6-stars heroes (Level 60 heroes). - Class of Epic heroes obtained will be random regardless of heroes combined. - 6-stars heroes combined need not be at max bread training level. - Epic heroes obtained will begin at rank 1 (1-star hero). Questionably too powerful/underwhelming depending on it's ability/process to evolve one in-game. - Beginners can't get enough bread or gold, and creating a 'dummy' 6* hero would be very taxing even for the late game players as well. - Maybe 7* heroes or epic heroes would require a 6* +MAX hero to promote in the future and some unique materials obtained from co-op or new dungeons. New exceed function available exclusively for 6* heroes who are trained to +MAX. - Option becomes available when hero is Level 60 and is trained to +MAX. - Exceeding the hero will increase it's level cap by +1, +2, +5, or +10 to a maximum level cap of 70. - Requirements: Another duplicate of the same hero level 60 (+0) is required to exceed the hero, and a fee of gold and/or honor. - Add a new NPC or function to exceed heroes for a few thousand gold/honor fee to perform the action. *When reviving after your entire party has died the leader is set to the original party leader. - If your original leader comes back from the afterlife the game should acknowledge their presence, and rightfully return leadership to them. - I think that if you spend the 1-2 gems to revive maybe you should be able to choose your leader to continue the battle. - Maybe the duration of invincibility could be increased by a few seconds and/or increase block generation as well to make up for the loss of the leaders blocks/special skills. - Reviving could increase the chance of finding chests and/or improve the rewards from them and/or maybe refill 25-50% of your meat? Examples: 2-10+ times greater gold rewards, increased chance to find chests, better chance of getting 4-6* weapons/bread, etc. - Questionable that charging 1 gem to revive in a quest is pointless when you could refill meat and do that same quest at least 8-10+ times over. - A new item purchase-able in the item shop which can be used to revive during game over. - 1 gem doesn't feel worth it to revive your team after game over. Re-filling meat is the same gem cost which can allow you to repeat that same stage and many more. - Add new Revive Cookies to the item shop. Maybe 3 gems for 5, 6 gems for 12, and 9 gems for 20, etc. A price that makes it worth of purchasing vs re-filling meat. 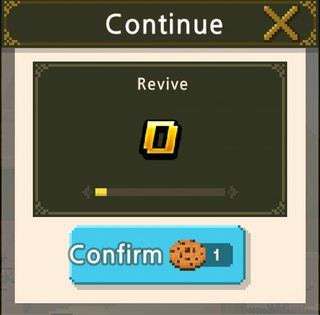 - Instead of a 1 gem fee to revive it will cost revive cookies. The same costs can be used (currently 1 token to revive in any stage and 2 tokens for FoS). - It's not necessary for the limited offers to appear every time you re-launch the game. - Add a button similar to the notices don't show again to prevent it from being displayed for 24 hours. - Or simply don't display it for ~24 hours after it's been closed the first time that day. I think the daily gifts from the Attendance Reward Calendar should be updated to reflect the new resources and content added in the latest patches. b) Remove 3* weapon and 5* weapons. Maybe remove these or replace them with iron? given as earlier rewards during the week? but not as final 7 day rewards. c) Increase the gold amount.You can blow well over 20,000 on a couple rolls when Fergus' greasy hand slips multiple times. Oops! e) Each week could include some amount of crystal powder, iron, gold, honor, and/or bread. f) The 7 day rewards should stand out and progressively get better along with the other rewards for each week. g) Some possible rewards to be considered for '7th' days: 5* random old weapon, 4* random SBW, destiny points, 6* bread or surprise us! I'm not sure whether if it was intended or not or if it is even a thing in-game, but it feels like the drop rate in WB was skewed towards gold bags since the release of the new and improved weapon box. As great as the weapon box is it's now harder to obtain an old weapon from anywhere in-game. To add on to that the special weapon dungeons are rarely available and don't guarantee any old weapons, or any weapon at all with the big jump in difficulty in the last 3F stage. a) Maybe add epic quests to obtain old weapons or iron? b) Maybe have a guaranteed old weapon drop or greatly increase the old weapon drops from any Weapon Dungeons final stage. Add a new NPC to forge an old weapon using 'x' amount of a specific classes weapon? Example: 3-5 hunter weapons that are 1-6* will forge an old weapon for hunters. a) Maybe the Alchemist can also forge a new SBW for a specific class using 2-3 crafted SBW's for that specific class. Example: 2-3 4* hunter SBW can be forged into a new SBW that cannot be any of the SBW used in forging. b) Maybe SBW can be converted back into an old weapon using a new item (dungeon/login reward/event) or another SBW as a sacrifice. Example: 4* No.9 SBW as the material with a new item/fee or another 4* hunter SBW to forge an old weapon for hunters. a) Rate up should mean a higher chance to obtain a rare hero (white carriage). b) Bring back the 4* hero rate up event. 1 rate up for Master Heroes, 1 rate up for Premium Heroes, or have 1 rate up event for both. Example: Increased chance for a white carriage carrying a 4* hero premium or master hero. c) Class contract (only) rate up events. Example: A rate up for paladins class contracts (higher chance of white carriages). d) Rate ups for specific heroes should apply to class contracts only? (not including rate up in premium contracts). Example: A rate up for no.9, mandy, magnus, and arona. Rate up for those specific heroes in hunter/archer class contracts. (average chance of white carriage). e) New class contract bundle. Roll 10+ heroes at a higher jewel cost (Maybe 80-100 gems) with 1 guaranteed 4* master/premium hero. Example: Hunter class contract bundle would include: 9 of 2-6* heroes with 1 guaranteed 4* master/premium hero on the last roll. f) New point system for contracts. Each contract purchased will give point(s) which can be used to purchase 4-6* hero contracts. Example: 10 premium contract bundle will yield 10 points. 1 Premium Contract = 1 point. - A 4* hero contract would cost 150 points, 5* hero contract for 250 points and 6* hero contract for 400 points. - The hero contracts could be for all classes or maybe offer specific class contracts at a higher point prices. Add Game ID in its own separate window which will display the full Game ID with a copy button. - If you don't have the support window or event window open on your mobile device it can make it troublesome to view it. 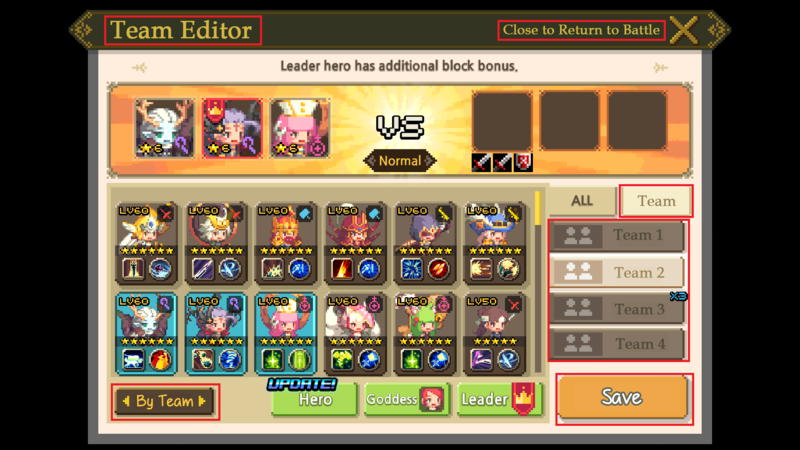 - Update the friend hero window displaying whether or not a friend has a hero equipped with an SBW. Same brighter glowing icon as the current hero window. - Increase the iron gem reset reward to a 50% bonus instead of 25%. Dionne's skills have been rebalanced. Upon using "The Raging Storm" after an attack, the precision of enemy attacks has been changed from 70% to 50%. Also, Dionne's skills will have a cool down. - Dionne needed more of a bug fix for the AI goddess spam than an overall nerf. Also affecting heroes ability to heal in some cases. - The main reason for all the complaints was that the AI in colosseum spammed Dionne endlessly which is abuse of goddesses abilities and caused many unfair losses. - The patch did add a cooldown, but the cooldown also affects Dionne outside of PVP which in turn has made FoS, and progressing through Tundra, etc. significantly harder. - Along with the 70% to 50% accuracy nerf, though it does make Dionne slightly less abusive in PVP it again makes questing more difficult. - The possibility of spamming Dionnes effect infinitely completely negates all other goddesses powers simply because they wonâ€™t be able to lay a finger on your team while using Dionne as you slowly pick them off with your team. - Currently there is no goddess that can PREVENT (not remove) debuffs/airborne. - How about making Sera's immunity to damage also immune to debuff and airborne? - For example if I activate Sera before Dionne strikes, then my team will not be airborne, and will not miss their attacks. This is not OP because Sera's skill only lasts 2 seconds. - Upgrade Aubrey's effect. Not only should she remove negative status, she should also prevent negative status during the goddess effect. - I tried to use her against a Roland+Sasquatch team, but she's completely useless against stunlocking. Last edited by D3Inity; 10-14-2015, 10:13 AM. Reason: Added Suggestions 28, 37c, and 37d. Also revised/updated â˜… ratings. Really love this post, nice job. Can tell you put time into it. I second everything you mentioned. "- The reward screen should appear at the very end with the total amount of meat you've earned including the results of the 10 matches wins/losses." This is a great suggestion, no more "+X" and "-X" points when you win/loose. It would be less frustrating if you loose at round 9 it won't show you "-X" points but it will show you all the points you earned during the 8 rounds, so technically you don't feel like depressed cause you just lost. Yes, the Team Editor. I would also opt for a list of all quests, like they did with list of all weapons, so we can see the rewards. Maybe create a reward for completing all Quests? I really hope TOAST will eventually implement the Ultimate Oven. 6* bread ftw. Added your suggestion above (29*). The Quest Tome/List sounds like an awesome idea! I'd love a way to be able to view all quests and know what we need to do to unlock or activate certain quests or quest chains. Also added and updated some suggestions in red. Let me know what you think! Last edited by D3Inity; 04-26-2015, 07:50 PM. Gonna assume you've already done all suggestions from the IRC thread? Last edited by IcyPhoenix; 04-26-2015, 10:16 PM. Yes sir! I've included every detail from that post here though it was really a mash-up of ideas so I figured it would be more appropriate to group each suggestion among others that are similar. Your post is actually a piece of what gave me inspiration to make this thread. d(^-^)b I've added both balance changes for Vincent and Sentinel R, and included the original link to the IRC Community Suggestions above. Hi, please include this if possible. It is a good suggestion. We have forwarded this to the appropriate teams, and will continue doing so as more are added. They have told us already that there are a lot of great suggestions here that will be considered for implementation! 1) Implement a visual indicator for passives with cooldown. For example, Woompa's SBW passive Totem Dance Time! !, Lilith's SBW passive Resurrection, etc. Maybe a clock icon on their status bar when the passive is in cooldown? 2) Currently there is no goddess that can PREVENT (not remove) debuffs/airborne. How about making Sera's immunity to damage also immune to debuff and airborne? For example if I activate Sera before Dionne strikes, then my team will not be airborne, and will not miss their attacks. This is not OP because Sera's skill only lasts 2 seconds. CinnaRoll Glad to hear that these suggestions have been forwarded to the appropriate teams for consideration. Hopefully we'll be able to see some of these suggestions in the patch notes for the coming updates! I'd like to suggest making friends usable in the FoS. Currently, there aren't too many reasons for maintaining a healthy friend roster. Most people can get through quest mode maps using only their own characters. Outside of quest mode, the only reason to even have friends in game would be for honor (And 5 honor points is really pretty measly). Making friends usable in FoS would go some ways to make friends useful in the late game, while also making soulbound weapons somewhat more accessible to newcomers.